A much-loved hippopotamus called Gustavito has died after an unexplained attack over the weekend in the National Zoo of El Salvador. The police are trying to establish who entered the animal’s enclosure at night and brutally attacked him. They said employees of the zoo were among those being questioned. Gustavito, 15, died late on Sunday. Officials have described it as a cowardly and inhumane attack on one of the most iconic animals at the zoo. Security Minister Mauricio Ramirez Landaverde said that while there was no evidence that employees or security personnel of the zoo were involved, he “ruled nothing out”. Although there are CCTV cameras at the zoo, none overlook the area where Gustavito was attacked. Zoo director Vladlen Hernandez said he did not believe employees could have played a role in the attack. “The zoo’s employees had great empathy for him, he generated empathy,” Mr Hernandez said of the hippo. 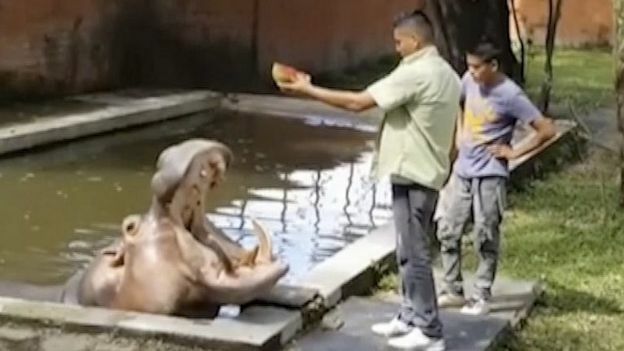 Unknown assailants entered the national zoo in San Salvador over the weekend and subjected the hippo to a sustained beating with what appears to have been sharp weapons and blunt tools. The following morning, the zookeepers noticed Gustavito acting strangely, refusing to eat and unwilling to come out of the pool in his enclosure. The zoo’s veterinarians then found lacerations on the hippo’s neck and face, and the animal clearly in great distress. His condition worsened on Sunday and he died late that night despite the efforts of the staff to save him.